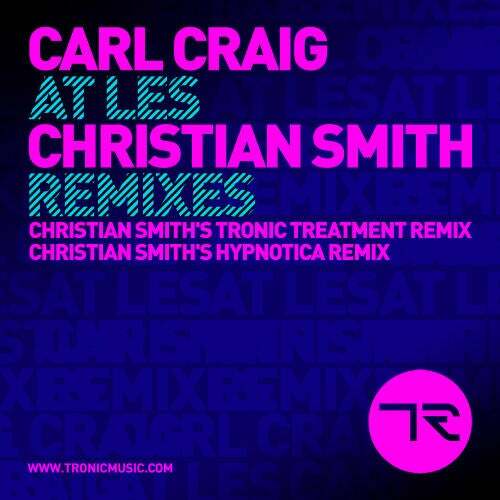 Fresh from a debut LP and three massive singles Christian Smith is set to deliver what is one of his most important and personal projects to date, his remixes of Carl Craig's seminal At Les, on his Tronic imprint this Summer. One of Smiths favourite pieces of music, At Les, has been a remix target of his for a long time but earlier this year inspiration and motivation combined and resulted in two brilliant interpretations which were immediately sent to Carl Craig, purely out of respect. Craig loved them, granted his permission and approval for a special remix package release on Tronic and now, here we are with one of the biggest releases of 2010. Delivered in both Tronic Treatment and Hypnotica Remix forms, Smith has taken the originals warmth, musicality and emotion and given them the sort of energy and power which has made him one of the most bankable producers of recent years. The Tronic Treatment remix starts slow but with careful and patient layering of melodies builds to an epic, peak time track which takes on an almost orchestral feel while the aptly titled Hypnotica Remix takes a slightly more aggressive, loopier and hypnotic take. Dave Clarke Very good, congratulations! John Digweed "Massive!" Both Remixes! Dubfire "Christian has managed to do a great remix of a timeless classic which is both reverent and of the moment. Well done! I closed with it at Awakenings festival and it sounded wicked!" Adam Beyer Love the "Hypnotica" remix that Christian made. Been playing it over and over and it was one of the biggest trax during WMC for me! James Zabiela Oh My God!!!!!! Going on my essential mix that was meant to be handed in this morning. Re-working to fit this in. ANTHEM!!!! !